The very heart of the Castle area – the rocks it is built upon – is like no other. It is difficult to compress millions of years of history into a few paragraphs, but this attempt showcases how heat, ice, time and a special set of circumstances led to the creation of the Castle region that we know it is today. The biggest lesson that can be learned from exploring the geological history is that what we have today is extremely special. The most basic action that is occurring over and over again is the creation, erosion and sedimentation of rocks. Most of the parent materials of the mountains in the Castle are sedimentary rocks – ancient rocks that were eroded and compacted into new rocks. And these rocks have been around for an extremely long time. Sedimentary rocks in the Rocky Mountains have been dated to over 1,700 million years ago. There are four main layers of sedimentary rocks in the Castle region. Each one was created over period of hundreds of millions of years, with the periods defined by major tectonic events. As the earth’s plates break up and come together, rocks are compacted or broken up into different material. In the end, the Castle landscape has been created out of ancient rocks that have witnessed millions of years of change. Through the movement and collisions of tectonic plates, the soaring mountains in the Castle were raised and pushed. Although a series of major tectonic events led to the creation of the existing mountain ranges, the most recent event is most significant. Starting around 80 million years ago and lasting 25 million years or so, the oceanic plate in the Pacific Ocean slid into and under the continental plates. The collision occurred at a uniquely subtle angle. Instead of being knocked down inward into the earth, the oceanic plate slid gracefully (or at least as gracefully as tectonic plates can slide) under the continental plates. This resulted in the buckling and crumpling of the continental plates without significant magna events – the North American mountains were created with few volcanoes. Most volcanic activity occurred in the ocean, near the sites where the plates had their first contact. “A simple analogy for mountain-building in western Canada is to imagine a rug lying on a hardwood floor. If you push on one side of the rug with your foot, wrinkles form in the rug ahead of the place you are pushing. The rug contracts there, losing width. The creation of the North American mountains was a phenomenal event – rocks were raised kilometres above sea level. As exceptional as the event was, the mountains in the Castle area have an even more unique story. As plates converge and compress, the Earth’s crust crumples and breaks. The result are thrust faults, or regions along the compression zones where rocks are pushed up. 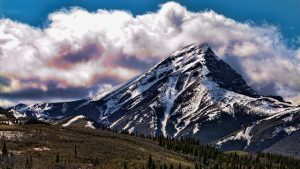 In the Banff and Jasper region, there are six narrow ranges of mountain. Each strip was created by a different thrust fault. The Castle and Waterton area is a different story. Instead of a multiple thrust faults that created strips or ranges of mountains, a single major fault (with the help of a bunch of little faults) created a significant displacement of ancient rocks. This event, which started around 75 million years ago, is now called the Lewis thrust and occurred over 15 million years. The result – the mountains between Glacier National Park to nearly Banff are not aligned in a series of strips, but rather they are a series of folds and buckles. Layers of ancient sedimentary rocks were twisted and turned. The Lewis thrust extended the mountains to nearly an additional 100 km east. As the Lewis thrust pushed rocks into an ancient sea, it created an abrupt transition from sea to mountain. Today, the ancient sea has dried up to reveal the prairies. This special zone of mountain to prairie landscape resulted in distinctive habitat for plants, animals and a special region for humans to gather. Over millions of years, tectonic plates colliding and compressing raised rocks hundreds of metres into the air. And over an even longer timeline, the forces of erosion shaped them into the mountains we know today. Erosion occurs all the time – even when the mountains were being raised. At the peak of the mountain raising era, the region likely looked more like a giant plateau that soared above sea level. This is similar to modern-day Tibet. Since then, nearly 10 kilometres of rock have been eroded away, As the soft layers of rock are eroded faster than the harder layers, valleys and peaks are slowly but surely formed. The biggest contribution to erosion – cold weather. Ice ages brought cooler weather and periods where snow and ice did not melt over the summer. Glaciers developed and retreated, scalping and shaping the valleys into their modern-day forms.